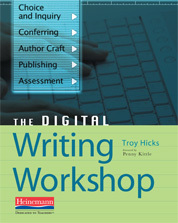 Assessing Students’ Digital Writing: Protocols for Looking Closely. Edited by Troy Hicks. Co-Published by NWP and TCP. By all measures, I am fortunate to work with so many incredible colleagues from the world of education, both K-12 and higher ed. Many times those collaborations happen in just a few hours, or a few says, and they then disappear. However, sometimes they last for months or even years, and they transform into something much more powerful. Assessing Students’ Digital Writing: Protocols for Looking Closely is one such example of that powerful kind of collaboration. 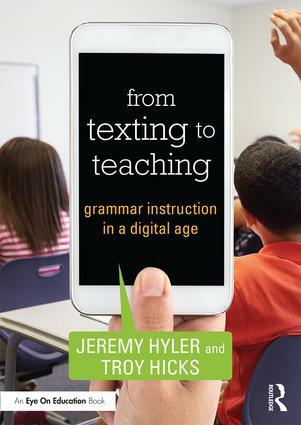 Troy Hicks—a leader in the teaching of digital writing—collaborates with seven National Writing Project teacher-consultants to provide a protocol for assessing students’ digital writing. 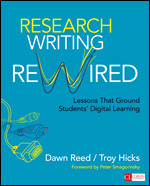 This collection highlights six case studies centered on evidence the authors have uncovered through teacher inquiry and structured conversations about students’ digital writing. Beginning with a digital writing sample, each teacher offers an analysis of a student’s work and a reflection on how collaborative assessment affected his or her teaching. 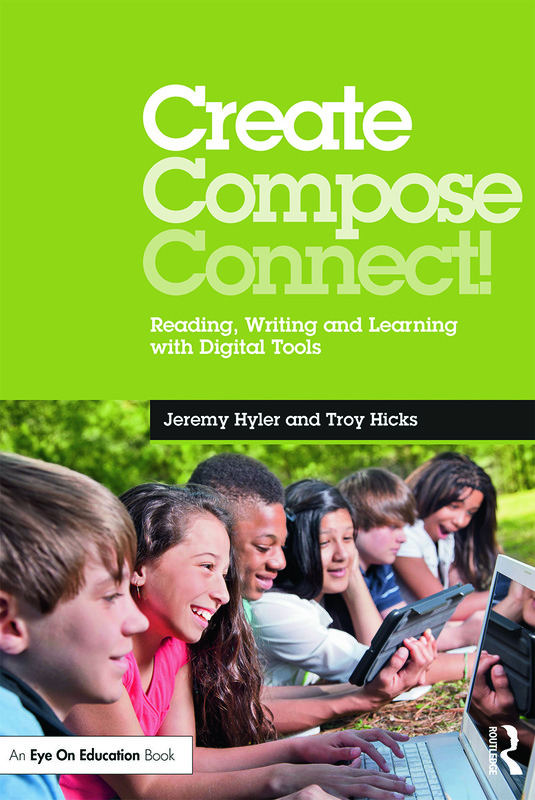 Because the authors include teachers from kindergarten to college, this book provides opportunities for vertical discussions of digital writing development, as well as grade-level conversations about high-quality digital writing. 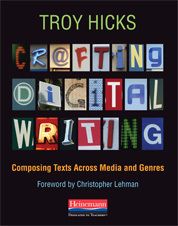 The collection also includes an introduction and conclusion, written by Hicks, that provides context for the inquiry group’s work and recommendations for assessment of digital writing. Christina Puntel’s “Chocolate and Change: Gaming for Social Justice” (Her entire chapter is also available for free download). 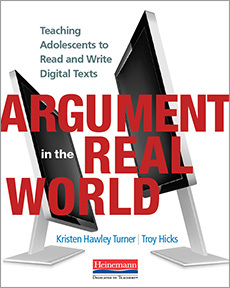 My sincere hope is that the student work shared in this collection and online will spark dialogue amongst teachers about when, why, and how they can and should integrate digital writing into their classrooms. If you have questions, please let me know. @hickstro Can various forms of new digital media (ie social networking, gaming) be effective in all content areas? At the time, I didn’t think I could answer in 140 characters, and I’m glad that I didn’t try. There are quite a few things to consider when answering this question, and perhaps it was simply the word “all” that threw me for a loop. Well, yes, in all content areas. I think. Wait, maybe not all. Most? Some? You can see how I pondered the question, turning it over in my mind. In doing so, however, I also began to think about the goals for content area literacy or, as it is being described more and more — especially by Tim and Cindy Shanahan — disciplinary literacy. And, in fact, their definition is at the crux of how I would answer the question. They believe that “Most students need explicit teaching of sophisticated genres, specialized language conventions, disciplinary norms of precision and accuracy, and higher-level interpretive processes” (43) and “the nature of the disciplines is something that must be communicated to adolescents, along with the ways in which experts approach the reading of text. Students’ text comprehension, we believe, benefits when students learn to approach different texts with different lenses.” (51). So, my short answer to Liz’s question would have been, “Yes, various forms of new media such as social networking and gaming can be successfully used in various content areas, perhaps even all of them,” as evidenced by tools such as EASE History, the Science Game Center, the National Library of Virtual Manipulatives, or any of the dozens of options available on this K-12 Tech Tools wiki. Students have created videos about science experiments and historical reenactments, and acted as characters from literature or actual historical figures on Twitter and Facebook. The deeper answer, and the one that I have been struggling with over the week, however, is a little more complicated. If we think about the Shanahans’ ideas that content area literacy is quite a bit more specific than simply applying a general set of strategies for writing-across-the-curriculum — as good as those strategies may be — then there has to be something deeper, something more rhetorical, to the idea of composing a disciplinary text with multimedia. Returning to Liz’s question, and pivoting it just a bit, I wonder: Can various forms of new digital media be effective as a tool for composing in all disciplines? Here, the answer gets a bit murkier, mostly because I am not a disciplinary expert outside of the field of writing. On the one hand, I can imagine that expressing disciplinary knowledge in math, science, history, or the arts — demonstrating a way of thinking through expert interpretation, analysis, and communication — could happen in any form of media. Heck, a whole movement in education, the flipped classroom, has come about because teachers have taken up the idea that they can create and deliver lessons via online video at least as effectively, if not more so, than they can do in the classroom. So, multimedia exploration of disciplinary knowledge is, conceivably at least, possible. On the other hand, I wonder what is lost when transitioning from writing (words into sentences into paragraphs types of writing) into multimedia composition? Are there components of disciplinary thinking that don’t translate well from words to images to video to links to… whatever other form of media we can imagine? At the same time, what do disciplinary experts gain in the process of being able to use images, voice, video, links, and other forms of media? How can they use multimedia to more fully express their ideas? What is it that we want to know about learning math — or science or music or art or anything — that multimedia can offer above and beyond print? Liz’s question has pushed my thinking this week, and for that I thank her. I’m hoping that this response pushes her thinking, too, as well as yours. What does it mean to compose, as a disciplinary expert, with digital writing tools? Hicks, T., & Steffel, S. (2012). Learning with Text in English/Language Arts. In T. L. Jetton & C. Shanahan (Eds. ), Adolescent Literacy in the Academic Disciplines General Principles and Practical Strategies. New York, NY: Guilford Press. So, I just finished hosting the lightening round of Tweeting that is know as #engchat (wiki link). I sat down sat down at Panera with my bread bowl at about 6:45, thinking that I would have time to eat and follow a casual conversation. An hour later, there were so many great ideas that emerged that I barely lifted my fingers from the keyboard, let alone my spoon. That said, I just want to catch a few of these ideas, and a few bites of my cold soup, before the restaurant closes! Even in a world of hyper-connected English teachers, we are still asking the right questions, both about teaching and technology. About access, both to the net and the tools. About teaching, both the content and the process. About assessment, both how and why. I really appreciated the questions that people asked, especially how they forced me to keep coming back to the writing and the writer, not just talk about tools. No matter how little or how much access we (and our students) have, we need to continue advocating for more. Milton Chen in Education Nation talks about how 1:1 access is a digital civil right, and this conversation on #engchat tonight reminds me of that. Both the chat itself (the skills and processes that I needed to engage in a twitter-based chat with colleagues is both a mental and technical challenge, not to mention how to stay focused) as well as the topics that it raises (when, for instance, do we want students to attend to an online chat as compared to a face-to-face one?) remind me of how incredibly complex this thing called “digital writing” really is. It is both immediate and archived. It is both multilayered/multithreaded/multimodal, yet intently personal and focused. It can enrich our minds and offer us alternatives, or it can drive us to distraction. When and how do we teach digital writing so that it can be useful and productive? There are incredible possibilities. One thread of the conversation spun off into the possibilities of gaming and how one teacher, Carl, uses Scratch with his middle school students. 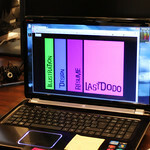 Showing the potential for interactive media as a space for storytelling (even if it is not “gaming” in the sense of programming and designing a full narrative with complex options), this example shows the ways in which a student can work to think through the process of writing in a different form. At one point, someone in the #engchat asked something similar to “what isn’t writing then?” and I think that it raises a good point. Whether spoken, printed, or otherwise designed with media, I think that “writing” is intentional. It involves an act of planning, revising, and producing. This Scratch example, to me, is clearly writing. Those are some brief, initial reflections. I am so thankful for having had the chance to lead the #engchat session tonight, as it gets my new year and new semester off to a good start, helping me rethink what it is that I hope to accomplish in my teaching, research, and writing in the coming months. How do we find the right content and connect it with the right student with the right teacher at the right time? The crucial thing about this is that if you graduate every student in the pipeline today, we will still not meet this goal. Stats show that many students are not graduating from high school, so this implies that many people need to get re-engaged. This will only happen with online learning. What does it look like in a social context that is professional? New models (Netflix/Blockbuster) — what does this look like in education? NOTE: I haven’t read up much about this, but there is information about it being distributed through MDE and other news outlets. What does “highly effective” really mean in an online environment? What other “spaces” can we create for teachers to share ideas and resources? What is officially sanctioned by the state, and what is not? What is the role of textbook publishers and other research-based work to integrate with teacher knowledge? We can’t test everything that we say we want kids to learn, only certain things, and some kids are learning more at different times and in different ways. So, then the question becomes what happens to kids as they figure out seat time/credit hours? 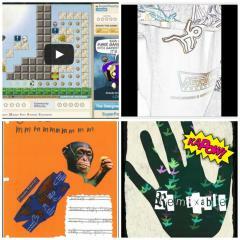 Intellectual property — how do teachers’ ideas get recognized in these online spaces? Creates problems with copyright and fair use. Creative Commons and Open Courseware as one option, but also some states and districts have earned RTTT money and are sharing through other avenues. What has surprised you about online learning? The personal connection, the human touch. Part of this is about the evolution of the internet and how we use social networks today. It is very easy to develop the relationships. When you never see students face-to-face, and you are teaching 125 a semester, when someone writes that “you are my favorite teacher” — that is motivating. The additional thing that surprises me is the connections that you make with your mentors and how much of a factor that they play in their students’ lives. What are your major apprehensions? If we don’t teach kids how to use their mobile phones properly, how will they learn these life skills? (NOTE: Again, I am a bit concerned about the tone that we take when we assume that we, as educators, have the “right” answer about how, when, and why we use the tools. Not that I disagree with the principle that we invite them to use these devices and applications, but I do worry that once we co-opt the digital tools and spaces that they are familiar with, we are changing the purposes and audiences for which they write and work). Assessment is built in to the system — the fact that student time online is logged. What are the roles that teachers and students play in the process of online learning? If you are just introducing it, you have to give it time. Initially, it depends on the success of the students that are there — highly motivated kids are successful and motivate other kids to continue working, too. This is rewarding for teachers — we enjoy having the opportunity to teach in a more flexible model. Old model was to have AP kids in advanced classes and remedial kids in other courses (kind of a dumping ground, without mentor support). We have now moved to a model where most students who are in our courses actually get to work and achieve a passing grade. We can bait the hook, but students need to bite. People talk about the way that online learning is better because it offers students new opportunities as compared to what they have experienced in school. This is especially true for students in credit recovery. Still, they have to be motivated and self-directed. (NOTE: So, in what ways does online learning really change the paradigm? That is, if students are reluctant to engage in school, for whatever reason, does the flexibility of online learning really overcome the negative feelings that they have towards school?) Can you meet them online through Skype and Adobe Connect or other similar tools? What are your strategies for connecting with online students? It is not about loving your subject, it is about loving your students. Students see it and recognize it, and they reciprocate. “I am here as an accident of history” — China was an ally, and my father was able to come to the US and learn about mining at Penn State, and my parents were married in 1945, although my mother didn’t arrive until 1949. They didn’t plan to stay in the US, but the stayed and I was born in 1953. “I think this is the first decade of the twenty-first century for education.” — we are at the tipping point. Have students see how other students are learning; what are the different paths that other students take and how can we learn from this public learning process? What is your definition of a great school? Make it short, make it measurable — are the kids running into school as fast as they are running out of it; are the kids so excited about their work that they do not want to leave school? Example of TV and video games — not good for kids, right? Actually, depending on the TV or game, it is good for you. Asking the right question — when are courses taught “better” online as compared to face-to-face? How is online more effective? What are the conditions under which it is more effective? So, when is K-12 online learning academically effective? So, what do we look at? How can we get highly qualified teachers? Teacher education is not the answer — they are not working with K-12 online schools. Do they have virtual internship programs? Most teachers leave colleges of education without any preparation to teach online. Does PD work — sometimes. PD only works when teachers take charge of their PD experience. Does online learning affect student retention? Retention is a significant problem, and they drop out for different reasons such as their own individual reasons, or institutional reasons. This happens at key transitions points, students are myopic, and there are disconnected understandings about what is happening and why. Engage in attention on pedagogy, innovation with technology, etc. What are some ways to get to better practice? Along with all the technology interests that I have had over the years, my formal introduction to online learning began around the turn of the century when I was trained as an online instructor with the Michigan Virtual High School. Because of a variety of reasons, not the least of which was starting grad school, I taught my last online course for them in 2002. Given my continuing interests in online and hybrid models of learning — especially in professional development for teachers — it was good to come to the conference today and get reconnected with the state of online learning. I do have significant concerns about the commercialization of online learning and how models like MIVU, Blackboard, textbook companies selling products, charter schools and other organizations who are working, in one way or another, for a profit versus the model of open courseware, collaboration, hybridity, and free or opensource web-based tools. This is a significant wedge that continues to grow. For instance, I set my courses up with a wiki, invite students to use free tools for collaboration and bibliography management, and engage with a variety of other tools. contrast this with the subscription that my university pays for to use Blackboard, including all the proprietary tools and content management. One of the resources that I was reminded of, and I know I need to continue my participation in, is Edutopia. Milton Chen talked about the many ways that educators are innovating, and that the “internet makes learning international.” It’s been one year since I was invited to be a moderator of a group on Multimedia Literacy, and I need to get involved again. Also, the implications for professional development for online teachers has just as much, if not more, resonance with our needs for traditional professional development. One of the main points that I will take from the final talk by Richard Ferdig is the fact that teachers, like students, need customized, just-in-time learning opportunities to find out more about how to teach and learn in their own context. I hope that we are doing some of that with our work this year in the CRWP/CGRESD partnership, and I look forward to seeing results from that work. It was an interesting day, especially in the sense that this conference was one that I chose to attend because it was outside of my normal areas of conference-going, yet remained on the border of them and moved my thinking forward in new ways.